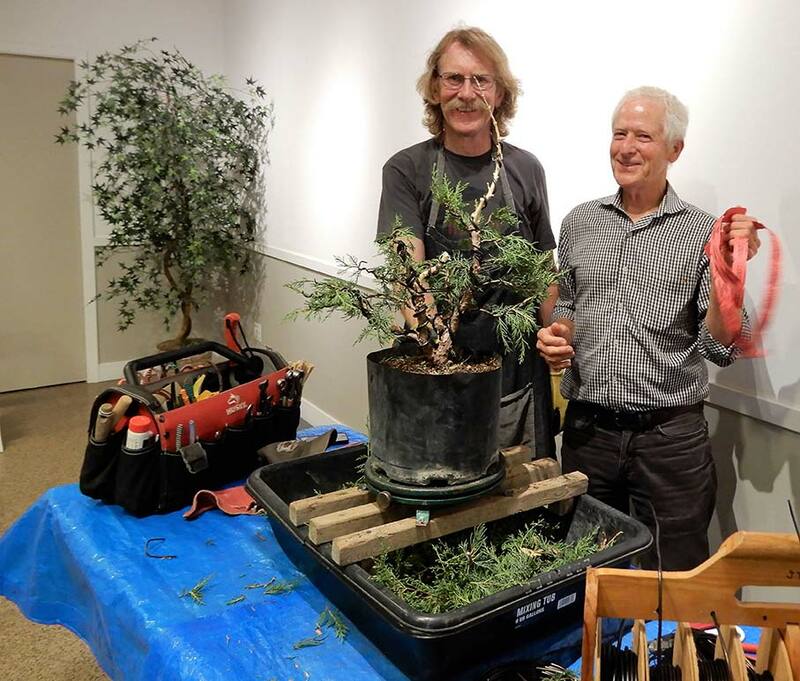 Those who attended the September 5, 2017 meeting of the Marin Bonsai Club were treated to the latest installment of the ever-popular John and Chris Show. 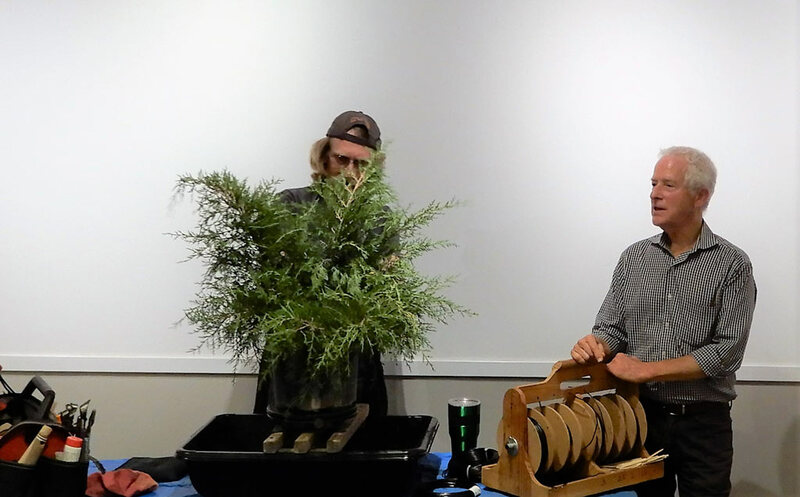 Two of our most avid and knowledgeable club members, John Doig and Chris Ross are like the Penn and Teller of bonsai. One of them does all the talking, the other does all the work, and they’re always entertaining. 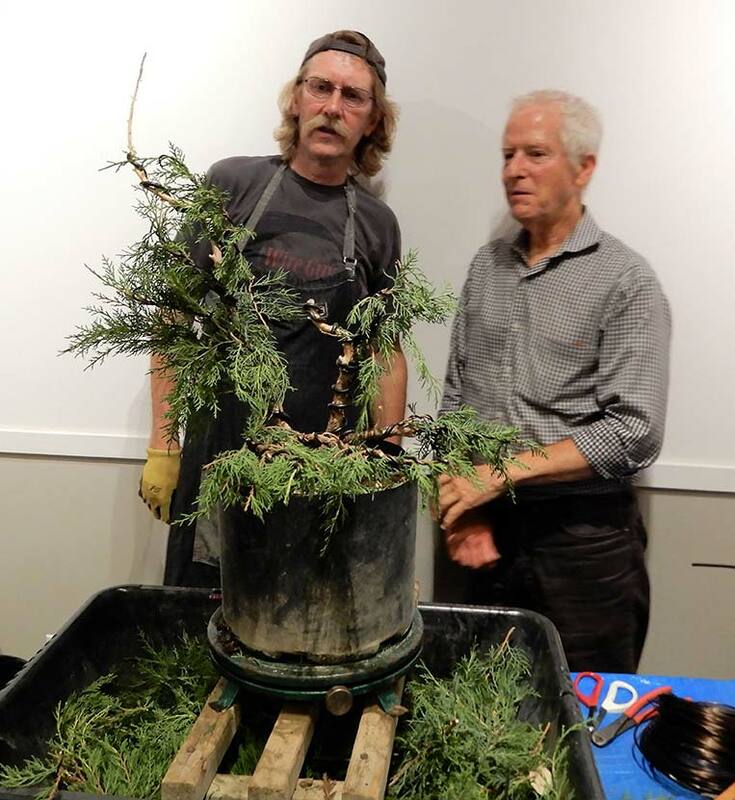 This time around, John and Chris were there to take a common juniper exactly like the ones that were provided for the Beginners’ Workshop participants and turn it into a remarkable pre-bonsai. I say “pre-bonsai” because Chris made it clear at the outset that the days of over-stressing common nursery trees immediately into showy bonsai for the purposes of a demonstration are over. 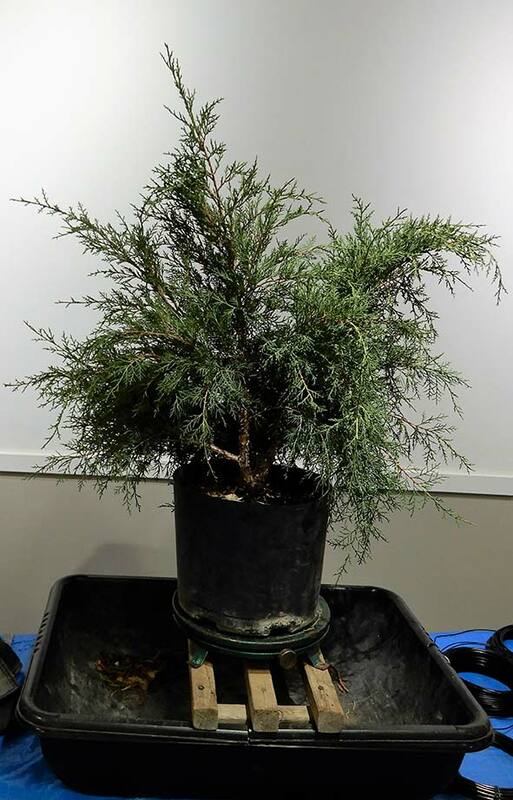 This juniper hit the bench as a bushy, lanky specimen from a landscaper’s nursery, raised to be a shrub, not a miniature tree. To transform it over the course of two hours into something you could show off as a bonsai would be almost certainly to sign its death warrant. If not the whole tree, large areas of it would probably die off as a result of that much stress. Such a transformation should be done in stages and John and Chris set out to do just one stage . . . or maybe two. Having said that, John and Chris can really work a tree into a remarkable piece of art even without stressing it to death. The first step for this one was to cut away as much extraneous material as possible to get a good look at the two solid twin trunks. I couldn’t help noticing early on that both trunks had equally solid first branches and that both of those branches were pointing in the same direction. I was sure that would force a decision somewhere down the line, and was not disappointed. Shortly after pointing out all the pruning that needed to be done to the top, John said that he was probably going to spread those two big branches apart, hopefully changing the angle of at least one of them. He finished his initial assessment by saying that he might design for an eventual tilt to be added to the tree at a future repotting. 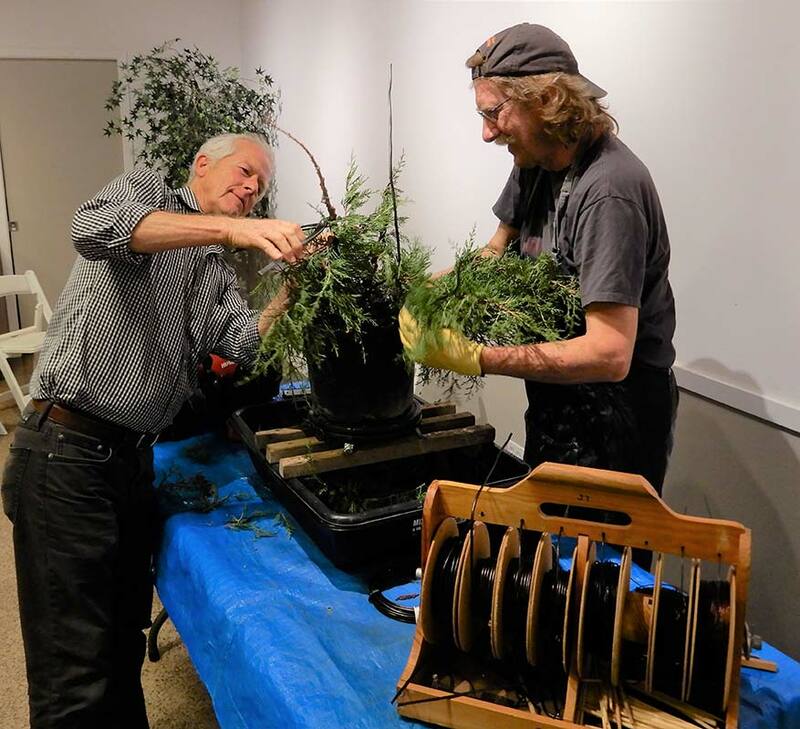 While John set to work on the tree, Chris began to talk a bit about some of the goals of bonsai development and the art of choosing a design for each tree that will create an idealization of its artistic potential. 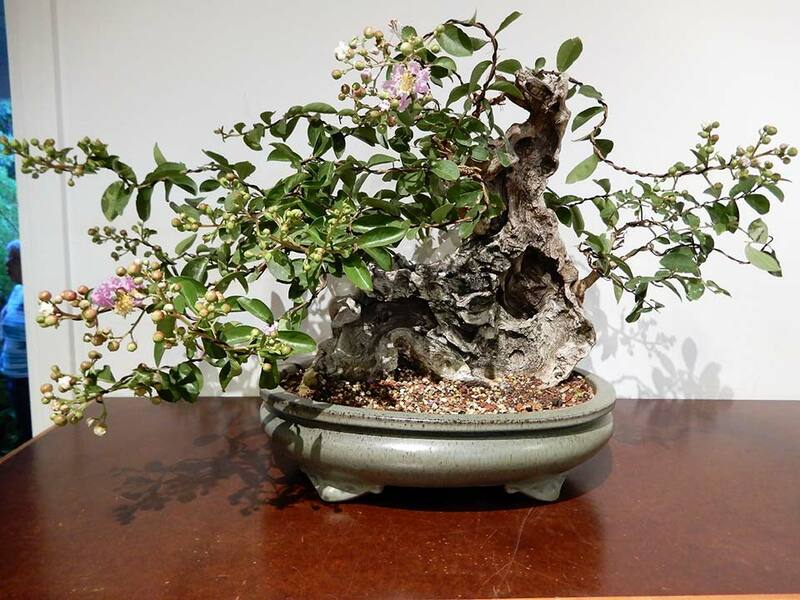 Particularly when converting stock into bonsai for the first time, it is important to carefully consider what changes the existing structure can support. For instance, not every tree can be a cascade. What the tree has done so far will dictate what you can do with it going forward. 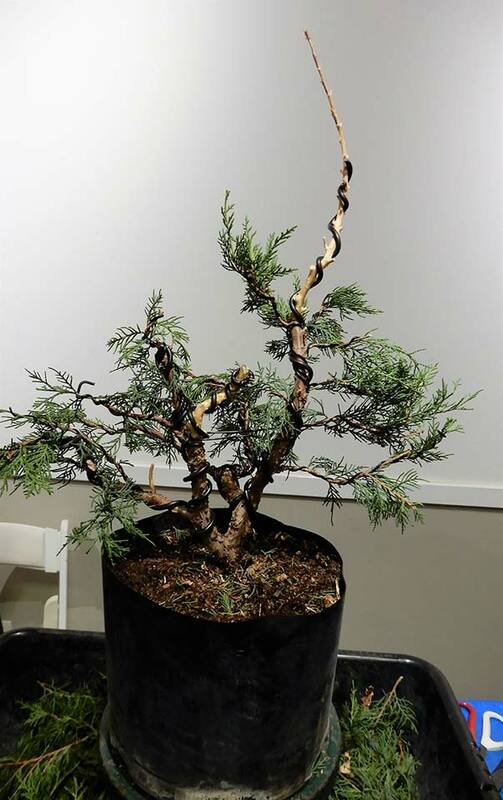 As an extreme example of this principle, Chris talked a bit about the smallest types of bonsai, shohin and mame, and some of the unique difficulties involved in converting to and maintaining those styles. 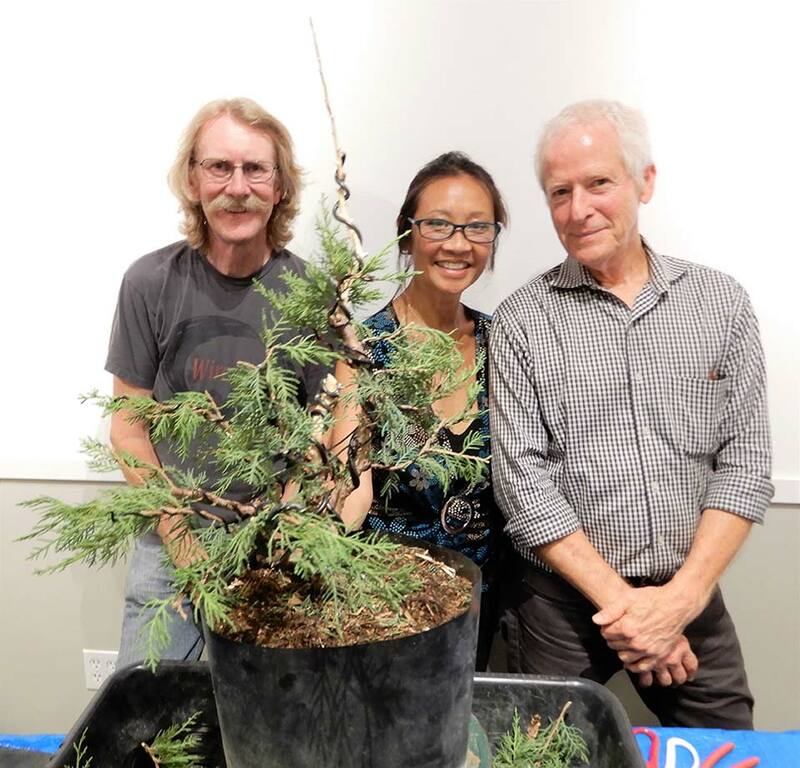 For those interested in learning more about these ultra-small bonsai, Chris referred to an excellent book on the topic by Herb Gustafson. John and Chris went with a two-trunk style for their juniper. They stripped the existing apex of the tree, turning it into deadwood, and chose one of the side branches as a candidate for the new apex. Later on, however, after some discussion among themselves followed by input from the audience, John and Chris decided to keep the existing apex, complete with its new deadwood. Much of the original tree was pruned away and John wired all of the remaining branches. He put some dramatic movement into the upper half of both trunks with the largest wire available, jinned another branch or two, and positioned all of the branches in support of a future tree with lots of movement and several distinct areas, or rafts, of dense growth. Crud. We chopped off the wrong branch, didn’t we? In line with their initial goal of not over-stressing the tree, John and Chris ended with a final result that by no means looked like a show-ready beauty, but the strong potential for a graceful future tree was clearly apparent. The tree was raffled at the end of the night, and Chris happened to be the winner. In a show of support for one of our new members, Chris decided to give the tree to Belinda Lee, who had signed up for the Beginners’ Workshop but was unable to attend at the last minute. Good luck with the tree, Belinda! I’m sure we’ll see more of its progress as you bring it to future workshops. Belinda is the Winner. Thank you Chris!